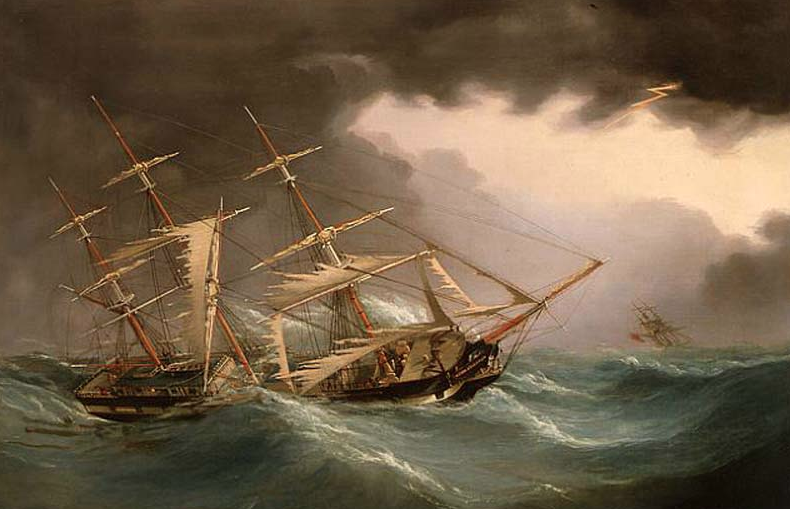 During a heavy snowstorm on March 9-10, 1860, the 250-ton brig Ewan Crerar struck Graves Ledge. The vessel anchored a short distance away as the crew tried to save the ship, but the Ewan Crerar sank within 45 minutes. No lives were lost. Arriving in Boston from London, the brig bore a general cargo that included linseed oil, soda, colors, beer, whiting, steel, iron bars, horn, wool, cutch (used for dying and tanning leather), antimony and arsenic. Divers salvaged much of the cargo. The Ewan Crerar was built at the shipyard of James Kitchin, of River John, Nova Scotia, and launched in the spring of 1858. Captain W. G. Crerar and Mrs. James Crerar of Pictou, Nova Scotia, were the proud owners. The Ewan Crerar was registered in Pictou. Nova Scotia was a British colony at the time, so the brig’s nationality is listed as British. Edward Rowe Snow, The Islands of Boston Harbor, p. 194.